As Canada became the second country to legalise marijuana on Wednesday, some areas faced their first major challenge as supply failed to meet demand. Customers queued for hours. Some retailers sold out on the first day, and shortages continued on Thursday. Online shoppers also faced delays as the new law came into effect, with high volumes affecting websites. Customers were warned to expect shipping delays of up to five days, as a postal strike looms next week. But the change was also lucrative: more than C$660,000 ($506,000; £387,000) was reportedly spent on the first day in Nova Scotia, one of Canada's smallest provinces. Shortages were reported in Newfoundland and Saskatchewan, and in the Arctic territory of Nunavut. Queues were still present at many outlets on Thursday, as customers turned away on the first day came back to try again. Traders weren't the only ones to take advantage of legalisation. There are still some restrictions on cannabis use and it did not take long for the first penalties to be issued, with one driver in Manitoba receiving a fine of C$672 for smoking in a vehicle. A member of the Winnipeg Police Service traffic division told CBC that the ticket was issued around 01:00 local time on Wednesday (06:00 GMT) - just an hour after cannabis consumption became legal. 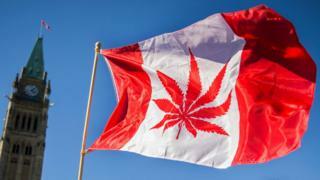 Canadian provinces and municipalities had been preparing for months for the end of cannabis prohibition, with legislation varying across the country. The change was a 2015 campaign promise by Prime Minister Justin Trudeau, who argued that previous drug laws were ineffective. He said the new law was designed to keep drugs out of the hands of minors and profits out of the hands of criminals. But there has also been opposition to the change, including from health officials. Video Legal cannabis in Canada: Should pot convicts get amnesty?